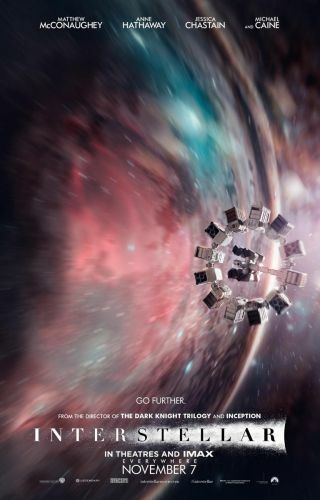 A theatrical poster announces the 2014 film "Interstellar." The long wait for Christopher Nolan's sci-fi epic "Interstellar" is finally over. "Interstellar," one of the most highly anticipated space-themed movies in years, opens in select IMAX theaters today (Nov. 5) ahead of its broad nationwide release on Friday (Nov. 7). One of those IMAX theaters is at the Smithsonian Air and Space Museum in Washington, D.C., which will host the "Interstellar" cast in a special Google+ Hangout today at 5:30 p.m. EST (2230 GMT). You can watch the "Interstellar" Hangout live here, and submit questions using the hashtag #InterstellarHangout. "Interstellar" is directed by Nolan — who also helmed "Memento," "Inception" and the "Batman" Dark Knight trilogy, among other films — and stars Matthew McConaughey, Anne Hathaway, Jessica Chastain and Michael Caine. In the movie, agricultural crises threaten humanity's existence on Earth, so a small band of explorers led by former astronaut Cooper (McConaughey) search for an exoplanet that could serve as a new home for our species. The pioneers journey to another galaxy, aided by a shortcut through a wormhole — a tear in the fabric of spacetime that allows relatively fast journeys between distant points. The film is visually stunning, with memorable depictions of a black hole, several different exoplanets and gorgeous regions of our own solar system. Space fans can double their pleasure on Friday night if they so desire: The Stephen Hawking biopic "The Theory of Everything" also opens nationwide on that day.